Notice how the strategically positioned flare on the bow prevents water from splashing up. The flare on the bow will also give the boat the lift it needs to get through and over large chop. To say that I was a little bit surprised when I first laid eyes on the Ultraskiff 360 Hull and Pedestal Mount is an understatement. It was not the normal type of watercraft that I have tested before. 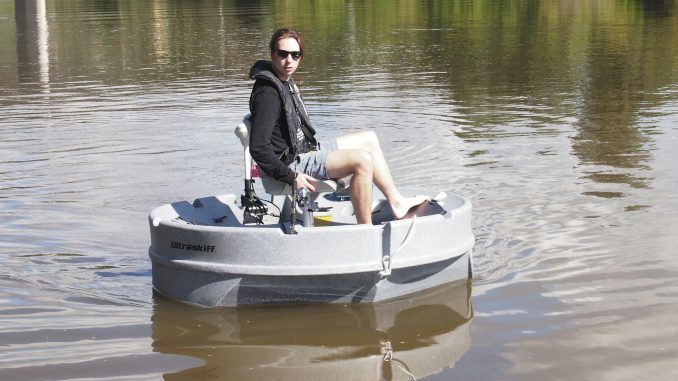 Sure, it floats, it has a moulded front, there is a propulsion method and you can steer it. You can sit or stand on it. There are some storage areas, it’s lightweight and you can fish from it. 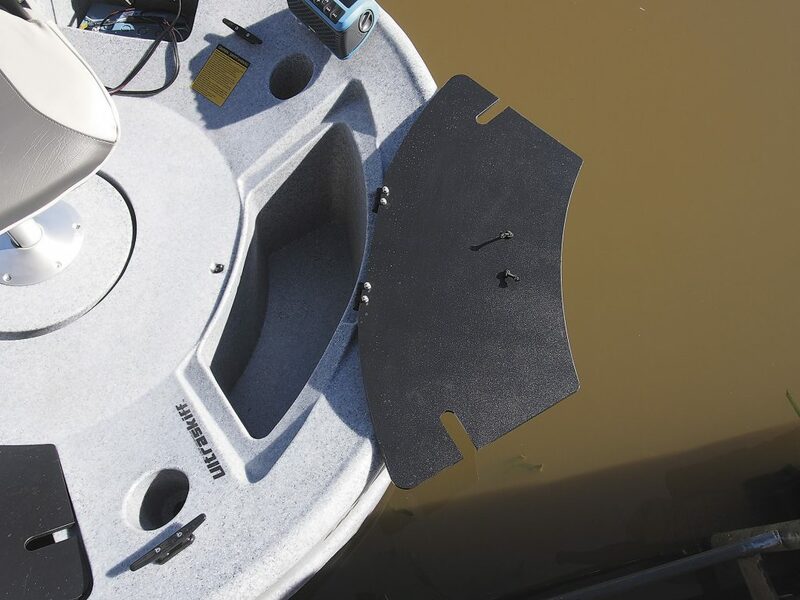 So, what’s different about the Ultraskiff 360 Hull and Pedestal Mount? It’s round! 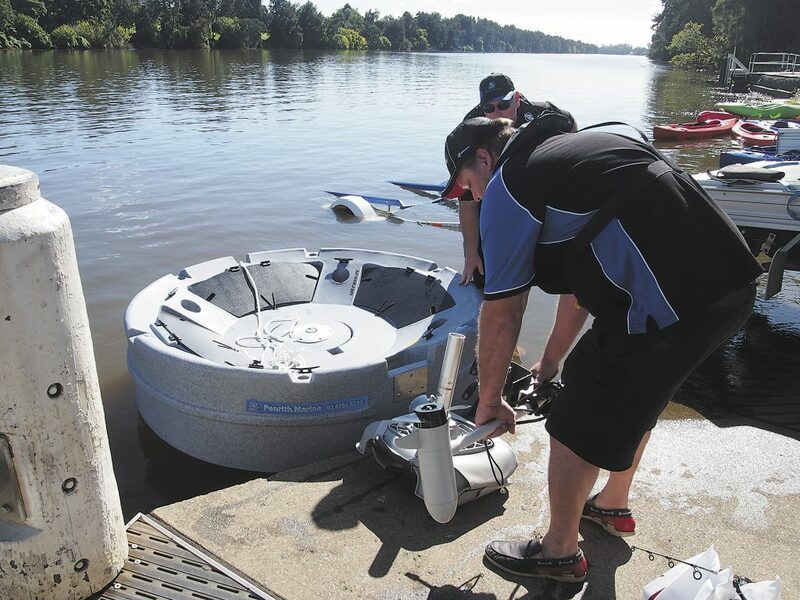 The Ultraskiff 360 is the original, first and only patented user-friendly, portable design of a round boat. 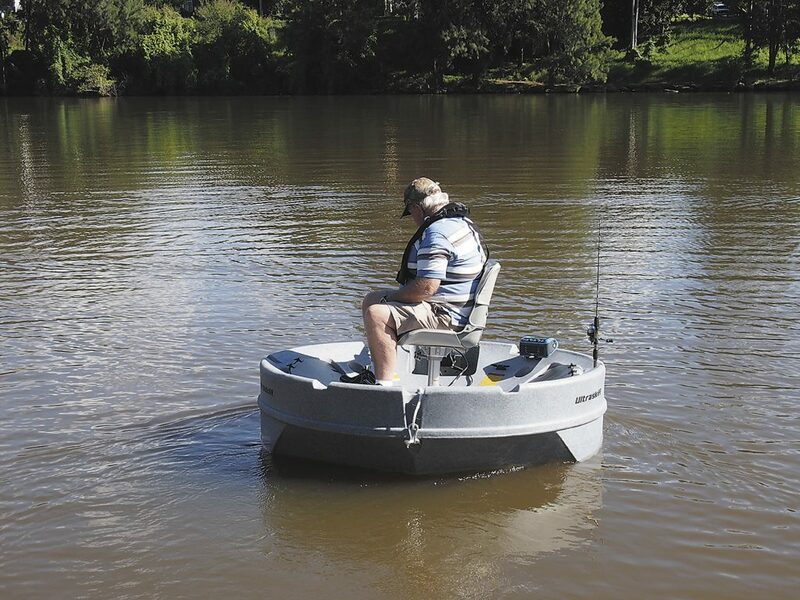 It’s a small lightweight, durable round watercraft that can be used for fishing, hunting and diving in both fresh and saltwater. Its lightweight construction of a roto-moulded polyethylene – giving it a hull weight of 56kg – makes it an easy option for a solo user. 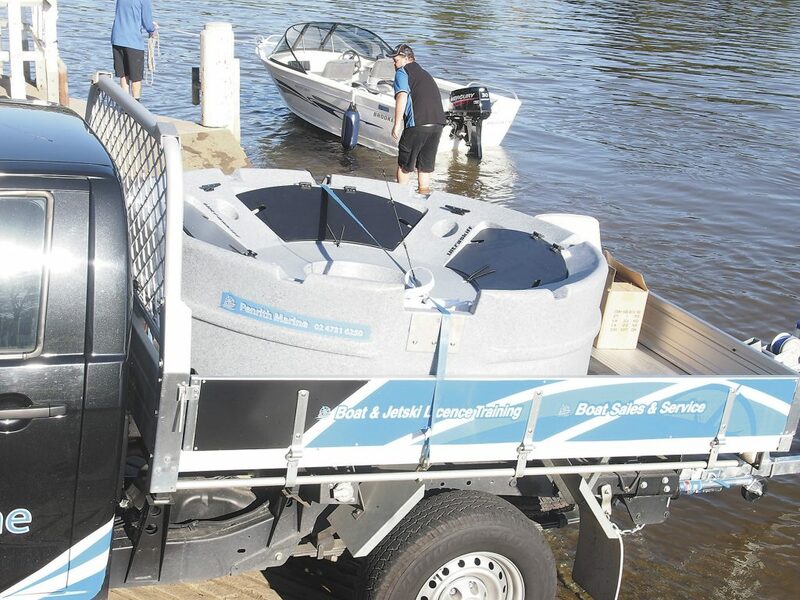 It can be easily transported on the back of a ute or in a trailer and once you arrive at your destination you can either slide it off and roll it on its side to the water. It also comes with flared handles to help with lifting. 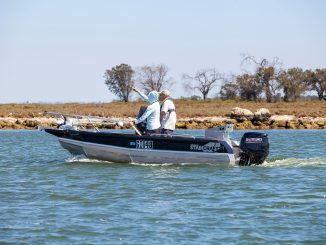 Having two anglers carry the Ultraskiff is the better option. This makes it much easier to place the Ultraskiff on the back of your transport. Remember when lifting the Ultraskiff 360 to keep your back straight and lift with your knees. If you are by yourself, you could roll the Ultraskiff to your transport and then lift into onto the back. There are three great storage compartments for your life jacket, safety gear, anchor and rope, fishing tackle and more. You can’t have enough storage room on a boat. 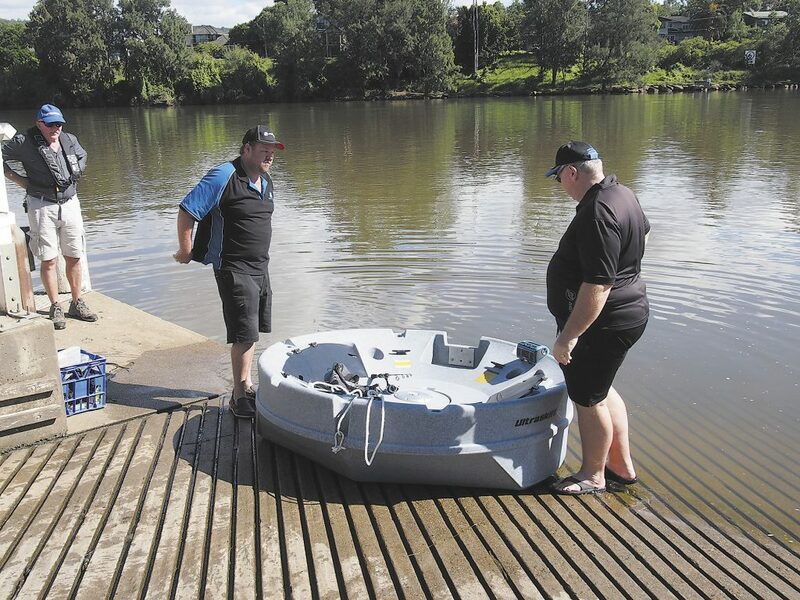 The Ultraskiff 360 comes complete with covered storage compartments, four drink holders, six different positions for putting a rod or two, four bollards and a pedestal swivel seat. The volume of the AM/FM radio nearly blew the author out of the craft. 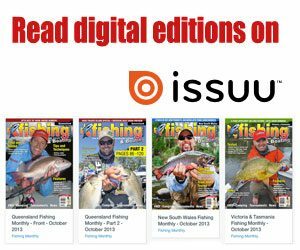 It’s not bad for listening to the footy or catching up with the latest fishing news. The MotorGuide R3 Tiller Steer 55lb Salt Water series electric motor is just clipped in the recess about the battery compartment. As a precaution, you could padlock the two toggles together so they can’t come loose and make sure the cable is tucked in so that there is no trip hazard. When coming into dock, it would be a good idea to have to the tie up rope already clipped to the craft. Remember to not come it too fast when docking. The author was doing about four knots at top speed with the electric. Using a Ultraskiff 360 isn’t a race. You would need to conserve the deep cycled battery for maximum use. The author couldn’t resist having a go of the Ultraskiff 360. 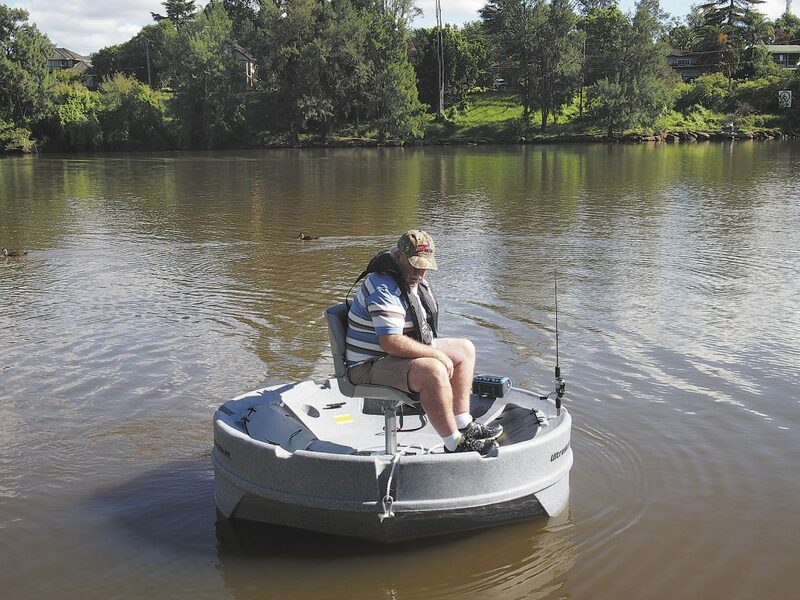 The Pedestal Mount swivel seat will give you plenty of comfort and back support while fishing. 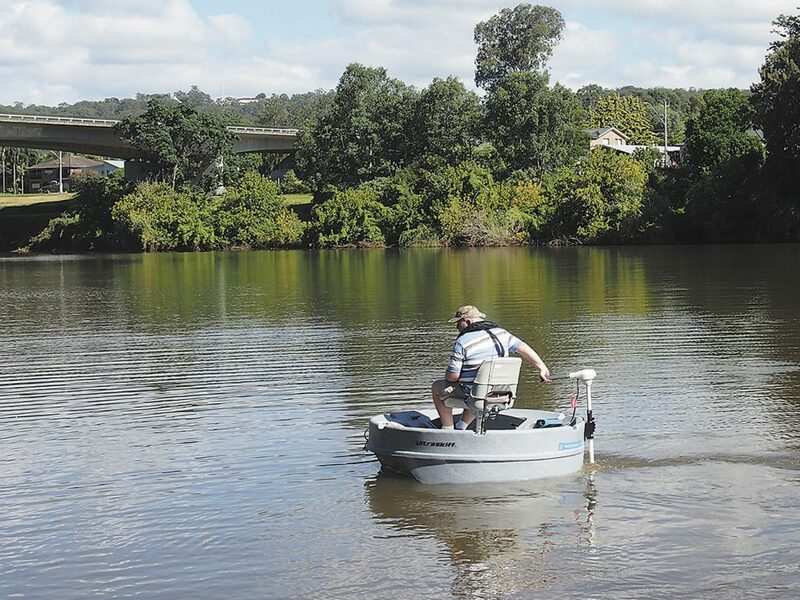 Whether you are right or left handed you will be able to steer the Ultraskiff with ease. 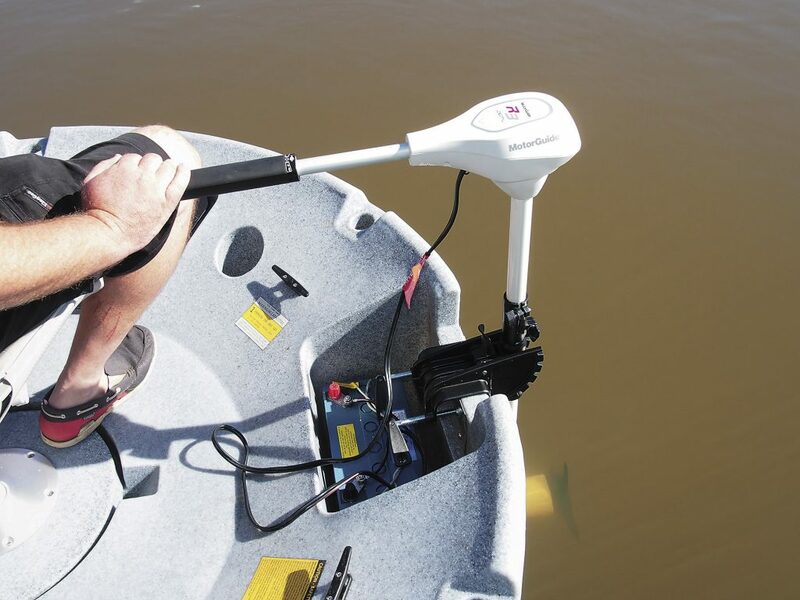 Make sure that you secure the Ultraskiff 360 while loading in your electric motor, battery and any other gear you may have. Quickly unload the rest of the gear and then move the car out of the way. Unloading the Ultraskiff 360 is quite easy. This can be done by either one or two anglers. It’s just a matter of lifting it out and placing it on the water. If you’re by yourself, you could roll the craft off the back. 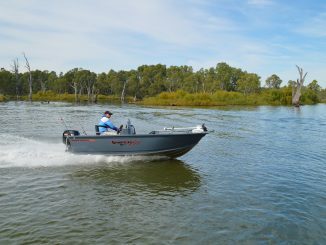 The Ultraskiff 360 hull by itself weighs in at 56kg, has a diameter of 1.83m and a depth of 508mm, making it easy to transport on the back of a ute with drop down sides or a small trailer. You could use two tie-down straps to secure it in the back of the ute. On the test day it was very calm and as much as I wanted to see how it performed when conditions were rough it was hard. I did find that when I drove it over the wake of some passing boats, the stability of the craft was very good. There was little movement from side to side and there was water splashing out to the front of the craft. This would be happening due to the moulded lowered flare shape of the hull. As I was going over the wake I found that there was also a small amount of water splashing up in the air and on a windy day I would say that it would splash over the deck and your feet. 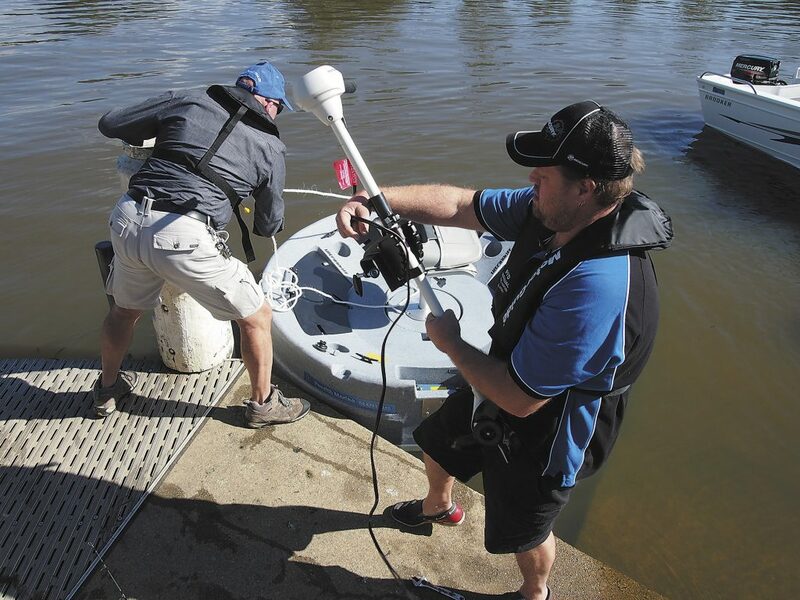 Any water that does splash over the side of the Ultraskiff 360 will find its way towards the centre of the craft and go down the drainage canal system and centre scupper. 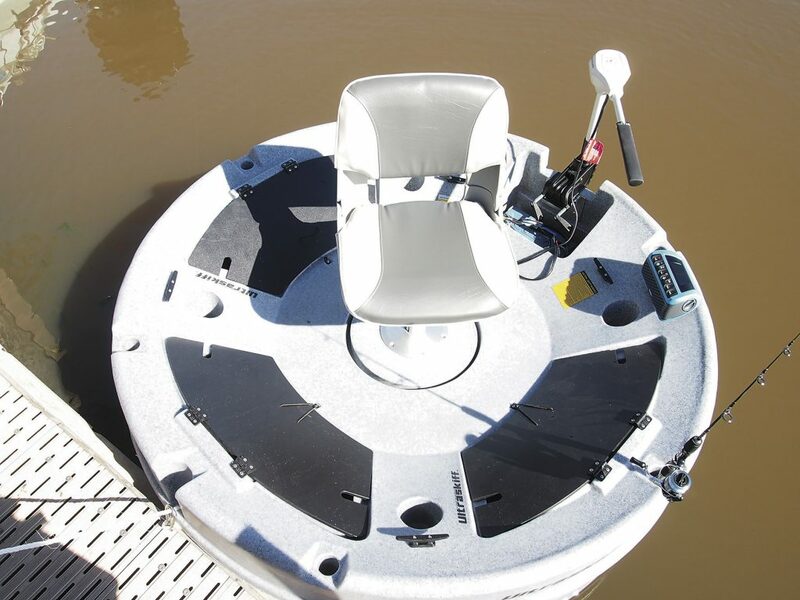 The centre of gravity of the Ultraskiff 360 when either sitting down on the pedestal seat or when standing up amazed me to a point where I felt very comfortable standing up and having a cast. There are three storage compartments with hinged doors. These would be good for storing your tackle as they have a lid for protection from the sun and there is a recessed edge around the edge of the lid. Even though the storage compartments are not sealed, any water that comes over the side or heavy rain will find its way down through the draining canal system to the centre scupper. As an added precaution, I would make sure that your tackle boxes are watertight. Each of the access hatches has slots that are used for feeding cables, anchor ropes and hoses into the compartments while the doors are closed. Every door has a bungee latch that you can tighten and adjust anytime. The storage compartment where the battery fits is exposed to the elements and it’s not self-draining. I would suggest that you put your battery into a battery box with a lid to keep the water and spray away from the battery and its terminals. 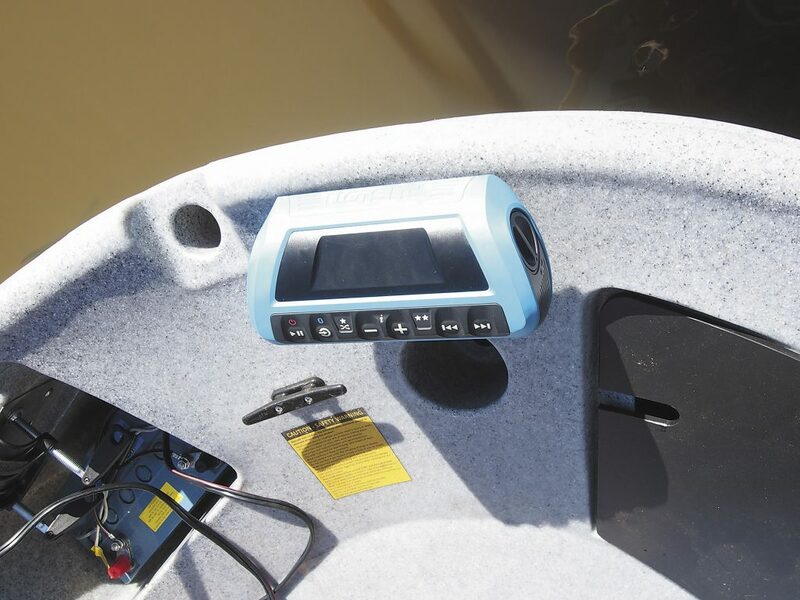 The Ultraskiff 360 comes with a 55lb R3 Tiller Steer MotorGuide that is positioned at what I would class as the rear of the boat on a reinforced stainless steel plate. Driving the Ultraskiff, I used it while going slow and flat out. I was quite surprised that I was travelling at approximately four knots. You wouldn’t be able to do this all the time, as it would quickly flatten the battery. 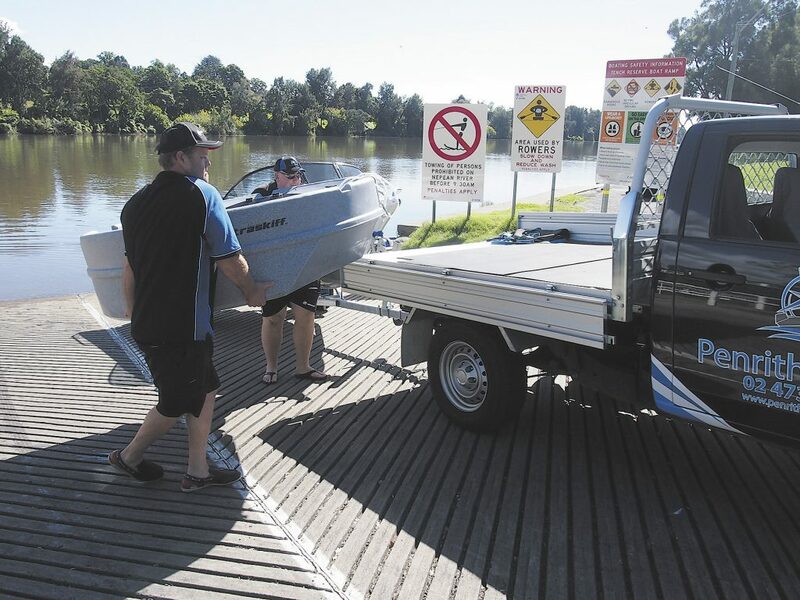 It has eight strap guides, strategically positioned around the perimeter of the craft to enable different methods of securing the craft in the back of a ute or on a trailer. The swivel adjustable and detachable pedestal mounted seat was very comfortable to sit on and has plenty of back support. There are a number of moulded threaded inserts that can hold rod holders, a variety of PVC attachments and a transducer. You don’t need a boating licence, because it doesn’t go 10 knots or over. It doesn’t have to be registered. A safety label must be displayed. You do need to wear a life jacket at all times. You need to have a waterproof floating torch at all times. It’s exempt from having other safety equipment (if not used as a tender). For further information, contact them to clarify. For further information, you can contact Gail at Penrith Marine on (02) 4731 6250 or call in to see them at 4/133 Coreen Avenue Penrith or email then at sales@penrithmarine.com.au or visit their website at www. 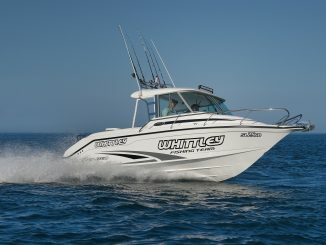 penrithmarine.com.au. One battery compartment large enough to hold up to Class 31 Deep Cycle Batteries. Four large cup holder/utility pockets. 4-5” cleats with threaded inserts underneath, allowing you to take them out and replace them with external rod holders or fish finders. Four bottom utility inserts hidden in recessed disks at all four corners of the hull bottom, allowing you to mount magnets, brackets and plates for transducers and pumps. A moulded tow ring that can be also used as an anchor pushpin holder. Two deep mould-in handles underneath the flare for lifting, carrying and dollying the boat by hand. Eight strap guides, strategically positioned around the perimeter of the craft to enable different methods of securing the boat to roof racks and trailers. Six rod holders, all equally spaced and perfect for creating custom duck blinds, tents, sun shades and anything else out of 1 1/4” PVC. Six skegs for tracking and hull protection. One bumper/roll bar. It protects the side when rolling, sliding or impact with a dock or piling. One drainage canal that lets water drain around the ring of the pedestal mount and through the main tunnel access in the rear. You can feed hoses and wires through the main tunnel and into the pedestal mount or underneath the pedestal mount through the shock absorber hose. Two transom plates that are stainless steel and removable. 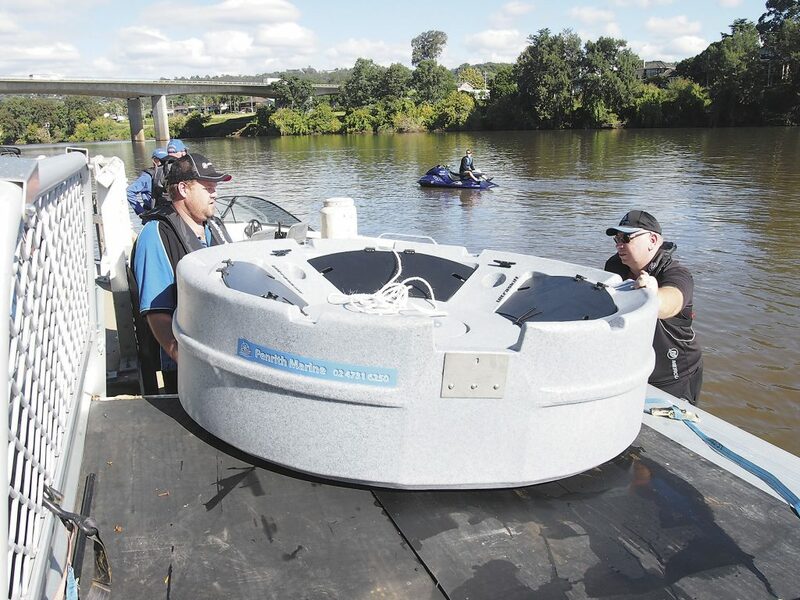 Two circle magnets – one for deck installation and the other for hull installation.